I’m submitting some things I’ve written to a contest sponsored by the News and Observer/Herald-Sun to win a free ticket to see Hamilton at DPAC and write a review. 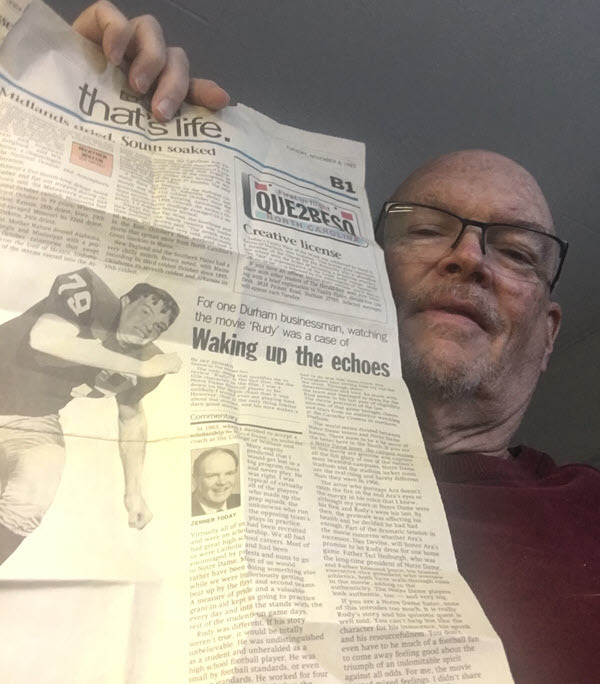 Since I didn’t have an electronic copy of a review I wrote of the movie Rudy in November 1993 for the Herald-Sun I did some rough origami and scanned it and am submitting it using a link to the scanned version that I loaded here on OrdinaryDurham. This came about when I saw the movie with my then girlfriend and bet her that I could write a review and get it published in the paper. Since I knew some folks at the paper when it was still owned locally, I thought I had a good chance. I didn’t hear anything right away and thought I’d lost the bet. But a couple of weeks later I had a call from Jim Wise, local journalist and Durham historian who was then the feature editor of the paper. He said that they wanted to run it as a feature. He wanted to know if I had any old publicity photos from back then. I did have one that was taken before my last year at Notre Dame when we won the National Championship in 1966. Given my lowly status on the team it had never been used before. Even if I’m selected, they aren’t promising to print the Hamilton review but I’ll do my best. I’d probably do a review here if I had a chance to see Hamilton in any case, but tickets are a little pricey for me, so this is my best chance to see it. Wish me luck. If you want to read it, it’s here. Jay, I remember Waking Up the Echoes very well. I just can’t believe that it’s been 25 years ago. Like so much of your writing, it was a timeless piece – so well-written and always leaving the reader with something to think about. Hoping you win the tickets – because I want to read your review!